Description	 MS in Neo Sumerian on clay, probably Larsa Babylonia, ca. 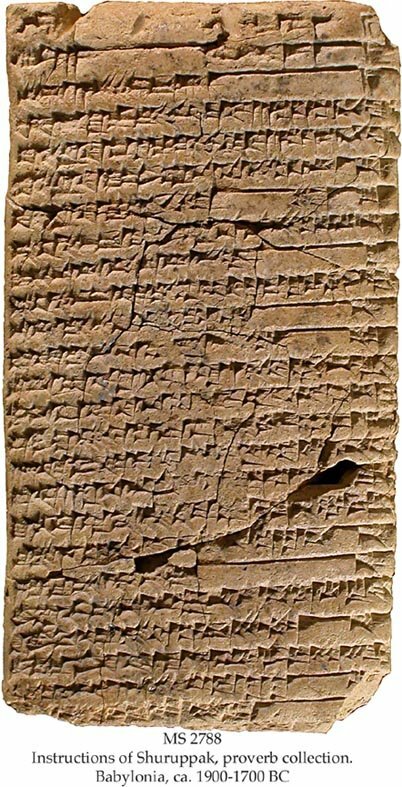 1900-1700 BC, 1 tablet, 12,3x6,5x3,0 cm, single column, 45 lines in cuneiform script. The text pretends to be addressed by the ante-deluvian ruler Shuruppak to his son Ziusudra, the hero of the flood story who, like Noah, survived the destruction of mankind and became the favorite of the gods. 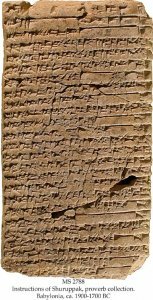 The Shuruppak instructions can be said to be the Sumerian forerunner of the 10 Commandments and some of the Proverbs of the Bible: Line 50: Do not curse with powerful means (3rd Commandment); lines 28: Do not kill (6th Commandment); line 33-34: Do not laugh with or sit alone in a chamber with a girl that is married (7th Commandment); lines 28-31: Do not steal or commit robbery (8th Commandment); and line 36: Do not spit out lies (9th Commandment). Similar proverbs in the Bible: Proverbs 6:1-5; 7:21-27; 22:26-27; 23:27-28. The last edition of this proverb collection is: Bendt Alster: The Instructions of Shuruppak. A Sumerian Proverb Collection, Copenhagen 1974. Published	 Bendt Alster. Wisdom of Ancient Sumer. Bethesda, MD, CDL Press, 2005. pp. 52-53, 101-102, pl. 60-61.